You learn from a young age the importance of drinking enough water every day. Staying hydrated is essential for balancing bodily fluids, cleansing the body of toxins and maintaining bowel function, but for people with Alzheimer’s, water’s effects on the brain may be the most important. A young and healthy brain cannot function properly without enough water, and people with this dementia can suffer even more greatly as a lack of liquids can cause symptoms to worsen. Dehydration and Alzheimer’s are a dangerous combination. About three-fourths of the brain is made up of water, and the organ requires an ample supply of the liquid to work at peak capacity. Gray matter actually shrinks, and consistent dehydration can cause the brain to age quicker than normal. 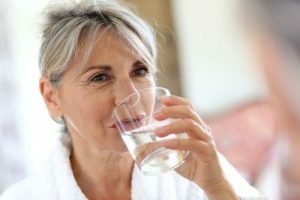 It’s a growing concern among older adults in general, and government research shows that dehydration is one of the primary reasons that people 65 and older are sent to the emergency room. For a person who has trouble remembering or often feels disoriented, even mild dehydration can be detrimental to his or her health and quality of life. A lack of water can aggravate symptoms of dementia, causing mental fatigue, sudden changes in mood, confusion and trouble processing information as well as nausea, loss of balance and headache. In severe cases, it can lead to heat stroke and unconsciousness. A well hydrated brain, on the other hand, benefits from enhanced concentration, memory function maintenance, mood balance and even better sleep quality. Water is also essential for heart health and muscle and joint function, all of which are necessary for staying physically active – another way to keep the brain oxygenated and sharp. Unfortunately, people with dementia are at a heightened risk of becoming dehydrated. They may simply forget to drink, and some have trouble communicating their needs to their caregivers. Additionally, certain medications can decrease the body’s levels of liquids. Seniors with incontinence issues have even purposefully avoided drinking in order to urinate less often. It doesn’t help that, as people get older, their sense of thirst gradually diminishes. Since signs and symptoms of dehydration in individuals with Alzheimer’s are similar to those of dementia, unknowing caregivers too often overlook dehydration as simply the effects of the condition. But the staff and physicians at Aegis Living are trained to recognize dehydration. Along with experiencing enhanced dementia symptoms, seniors may have dry mouth, fatigue, muscle weakness, lightheadedness, dizziness and rapid breathing as well as low urine output or yellow urine. Knowing how to spot dehydration is great, but avoiding it altogether is the real goal at Aegis Living. The Alzheimer’s Association recommends keeping those with Alzheimer’s hydrated by making fluids easily accessible. That’s why there are hydration stations located throughout each assisted living center, making water accessible to seniors at all hours of the day. These beverages are made more attractive for seniors with natural flavors such as slices of lemon and strawberry. Additionally, there are visible notes that remind residents to drink at least 8 ounces of water five times per day. Aegis Living also makes staying hydrated fun and delicious in other ways. For example, the assisted living leader teamed up with Michele Clarke-Mason, a nutritionist for the Super Bowl-winning Seattle Seahawks to come up with an engaging way to quench thirst. She developed a healthy smoothie that not only provides nutrients and liquids to the body but also enhances brain health. The Stealthy Green Smoothie combines essential antioxidants with the natural superfood kale, among other ingredients, to create an anti-inflammatory effect and building blocks for minerals and neurotransmitters that enhance brain function. It has been approved and commended by Aegis Living Chief Medical Officer Dr. Shirley Newell. Keeping residents quenched is just one of the many ways that Aegis Living strives to boost cognitive wellness. Along with providing stimulating games and an environment that musters up memory of life’s joys, each center ensures that seniors eat a balanced diet for optimal mental function. By incorporating brain-boosting superfoods, such as salmon, blueberries and whole grains, into each meal, these communities aim to enhance quality of life by keeping the mind alert and body healthy.